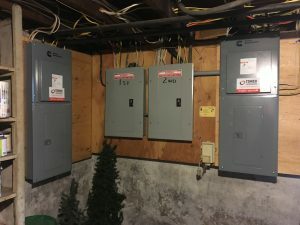 The owner of this two-family house was looking to provide power for the essentials to both apartments during power outages. Separate electrical services but a combined gas service made this project unique. We designed the power system around a 13kw with two transfer switches. Tower began the project in the cold month of January so that the customer could have their back up power before the stormy month of February arrived. Heating blankets were utilized to permeate the frost so that the limited trenching could take place. Tower has what it takes to keep projects rolling wherever possible.